This entry was posted in Fun Stuff on December 9, 2015 by Steve Tilford. Yesterday I rode over to Lawrence on gravel, go my van and drove over to Kansas City to retrieve a car part. I was driving on Hwy. 24, with is a Kansas highway, not interstate. I had underdressed a little and didn’t really feel that good anyway. I felt a little bonky and decided to stop at a Caseys General Store and get a slice of pizza and coffee. Their pizza isn’t have bad, but their coffee could improve some. It got me thinking about an experience I had in Switzerland right around 30 years ago that still cracks me up. Back in 1985, I had ridden the World Road Championships in Italy and then drove up to Switzerland with my team director, Michael Fatka and Trudi. We were going there because Michael was looking to get a dog, a Swiss Appenzeller, sort of like a Bernese Mountain dog. Anyway, we were hanging out in Appenzell, a region just east of Zurich, close to Austria, looking at farms for these puppies. It was a good adventure. Super scenic area to ride a bike. You should make it a point to go there if you have a chance. One evening we decided to go for fondue, because the region has a famous cheese. So we go over to this pretty expensive fondue restaurant and there is a wait, but the hostess tells us, in German, to go to the bar. So we go to the bar and order a beer each. She said it was going to be close to 30 minutes. Just after we got our beer, the hostess came over and told us that our table was ready. So we took our beers and started to follow her. She saw that and told us we could not, absolutely could not, bring the beers to the table to have with the fondue. Trudi can speak German, but the woman was speaking Swiss German and she explained to Trudi that the cold beer and hot cheese would kill us. Yes, she said kill us. Her explanation was that the cold beer would harden up the cheese in our stomachs and that we would get sick and die. So, we had to finish our beer in the bar and have warm white wine with the fondue. I made a lot of good Swiss friends over the years and each and every time I ask them what they think about the idea of drinking cold beer with fondue. Not one has said anything different than the hostess. I have a friend, Trudi Karrer, who I stay with near Zurich, and saw just a couple months ago at the Richmond World Road Championships. She told me for sure you would die. My friend, Thomas Frischknecht, who came to the US when he was 19 and is a smart guy, answered similarly. Thomas said you might not die, but you’d get really sick. My best argument to them is what is the difference between fondue and pizza? Both are bread covered with melted cheese. And we drink plenty of cold beer with pizza. My rationale is that once food gets into your stomach, it eventually gets to 98.6 degrees, or whatever your body temperature is. It really doesn’t matter how you mix it because it all gets to the same temperature. Of course, you can shock your system by ingesting a ton of super cold stuff. I remember drinking a huge fresh fruit slush at Sonic after a hot ride and the whole way back to my house, I could feel the skin on over my stomach and it was super cold. I thought that was creepy. But I would have no problem eating pizza and drinking a slush, which is just about the coldest thing I can think of to drink. 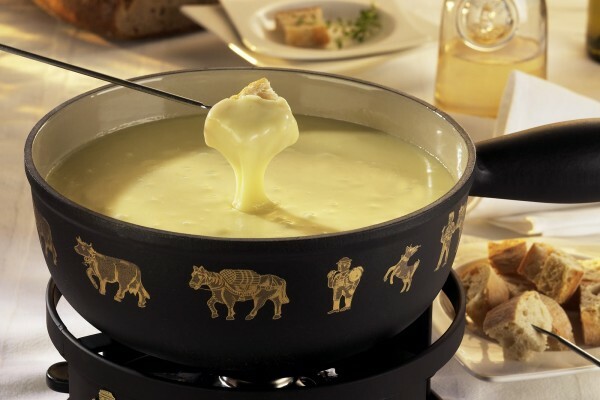 Anyway, I never could, or can convince, a Swiss person that fondue and beer won’t make you ill, or worst case scenario, kill you. It must be something that they were taught from childhood. All of them. And it seems to have over ridden critical thinking. Funny. i’m totally off fondue from now on. I thought I remembered something about Kris and a slush and getting sick but I may be thinking of someone/something else. will need to post about. Geez…where I come from, hot cheese and cold beer is comfort food. Now tequila and jalapenos…that’s a whole different game ! Steve, did Michael get Gaylen, my favorite dog, on that trip? I get that when I tell people that press fit bottom bracket bearings are stupid. I get the same thing when I tell them that nothing beats a CK old school headset. Does American chain fondue restaurant The Melting Pot serve beer? That should clear things up definitively. This is just an old muth. My (Swiss) father used to tell us this when we had our fondues every few months as kids. However, it is just an old wives tale, and I have tested it many times. There is NO truth to this story. Do doubt a myth perpetuated by the wine industry. Remember when Lemond was out with Kathy and a photographer snapped a shot of the two of them eating ice cream? The European public was doubly horrified. First that he was ingesting ice cream during the TDF. Second that he was hanging with his own wife (and presumably having relations with her during the Tour). Not long after, he got “caught” playing charity golf tournament. Cyclists apparently shouldn’t stand up and walk very much during the racing season. And if I had to wait an hour before swimming so I wouldn’t cramp. I wouldn’t had much of a grade school, HS, and college swim career either. Now drinking beer with ice cream may cause you to explode or burp a lot. Leading cause of death in Wisconsin. Fondue and cold beer is a killer combination. All kidding aside, you will die. In Switzerland many years ago we stopped in Gruyere, the home of “swiss” cheese. Not the crap you see in US supermarkets with holes in it, this was the real thing. There RACLETTE is the thing – melted Gruyere over all kinds of stuff. Being a dumb American, I insisted on drinking “Vino Americano” which is Coca-Cola. Our Swiss friends were aghast, telling me I would have the mother-of-all gut aches if I insisted on drinking Coke instead of the local white wine. I paid them no mind…but paid big time that night with….the mother-of-all gut aches!!! I’ve enjoyed RACLETTE a few times since, ALWAYS with white wine… with no troubles.